I thoroughly enjoyed reading this interview with Erdem, especially his life motto: "Keep calm and carry on", highly applicable to the day I had today. Beautiful, beautiful dresses. 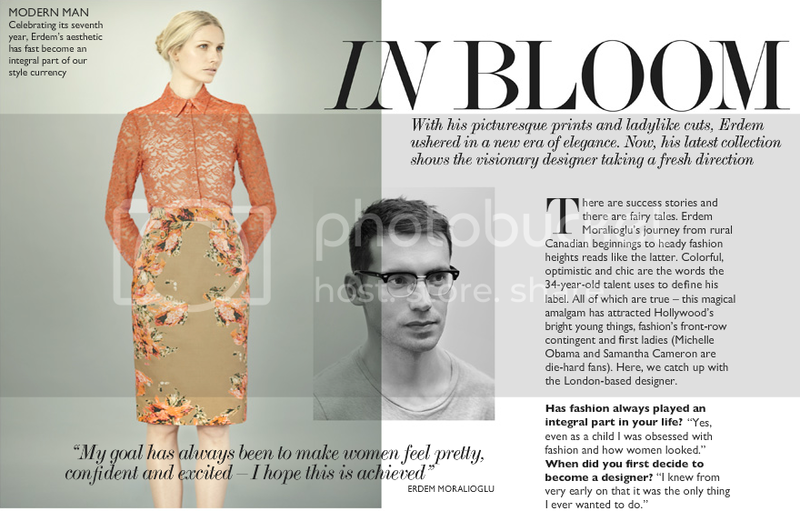 I particularly love the one shown in the ne-a-porter interview (the camel coloured dress with coral flowers). A few years ago I was lucky enough to be in the backstage of an Erdem show in the London Fashion Week. Just because it took place at the college I used to live, and the show organisers were kind enough to let a few students to stay in the backstage. It was lovely, although he is still little known at the time (I think he was part of LFW New Generation desingers).